Depending where you’re staying in Auckland, Al’s Deli could make a good place to eat breakfast at the start of your day – they serve the kind of breakfasts that will give you fuel to keep going through to lunchtime, even if you’re packing in a lot of sightseeing! Otherwise you might want to pick up some takeaways for a picnic lunch for instance at Myer’s Park. 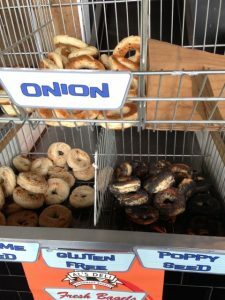 The deli is known for it’s handmade bagels which are available daily in several different flavours. There are also burgers, salads and various grilled items on the menu – all very typical of an American Diner. There isn’t a kids’ menu but they’re happy to make smaller meals of anything that can be resized on the menu and they’ll alter the pricing accordingly too. The staff are friendly and the atmosphere is very relaxed. Address: 1/492 Queen Street, Auckland although the entrance is on City Road opposite the Wilson Car Park. There are other branches in Kingsland and a deli/brewhouse on O’Connell Street. Check the website for details. Open: from 8am Monday – Friday and 9am Saturday & Sunday. Closing times vary but roughly 8pm or later – phone to check.